Spotted More Paper Block of the Month has 12 bold, colorful blocks - one for each month. The gray and cream backgrounds are full of interesting textures and graphics. You’ll use a variety of techniques like traditional piecing, fussy cutting, applique, paper piecing, and more. The finished quilt measures 85” x 85”. It’ easy to complete this quilt with the month to month pace. The final assembly incorporates large panels highlighting the unique patterns on each of the fabrics. This is a 12 month program beginning in January and finishing in December 2019. The block of the month includes the pattern and all fabric for top and binding. $18 Each following month you’ll receive fabric for the month’s block. Each quarter we will introduce a new 12" x 40" seasonal wall hanging made in the embroidery hoop. We have added some interesting textures to our fabric selections, so you will experience working with cork and Kraft-Tex. We will also be featuring a different binding technique, facing. Designs will be available a season ahead, so it’ll be ready to hang on your wall! 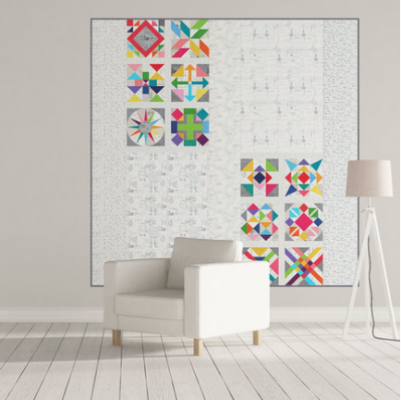 Each quarter your kit will include all the fabric, quilt top, backing, and binding. The first month we’ll supply a jump drive loaded with the multiformat embroidery designs and instructions. Bring your jump drive back each quarter to receive additional designs. Each quarter you’ll also receive a FREE seasonal bonus embroidery design! You will also need some additional supplies not included in the kit:: 15 yard roll of Battilizer, thread, Trimmer by George, and Hoopsister scissors. The minimum hoop size needed is 6” x 10”. Each quarter we will have a Demo Saturday to share tips for the new wall hanging and discuss the bonus project. On demo day, your kit will be ready for pick up to sew at home at your leisure or join us for a Sewcial sewing day. We will also have optional kits to purchase for the bonus project.